On 10 June 1942, German Police Units destroyed the Czech town of Ledice (LED-ECHEE), shooting 167 male inhabitants, and sending the women and children to concentration camps. The town was razed off the map, plowed under, and all trace of it was obliterated. After the war, I believe only seven children were reunited with their mothers. This act of capital punishment was the vengeful response of Nazi Germany for the murder of Reinhardt Heydrich, Obergrüppenfürher in the SS, and Butcher of Prague. 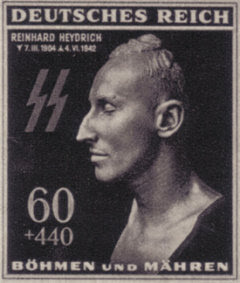 In total over 1000 people were beheaded or shot as punishment for the assassination of Heydrich. The officer in charge of the proceedings, Frank, was hanged by the Czechs after the war, although the actual man in charge of the executions, Max Rostock, was killed on the Russian Front. After this horrible day in history, these draconian measures turned out to be counter-productive; it united the Czech people into an underground against the Nazis, and produced an outpouring of condemnation for the Nazis. The atrocities committed at Ledice shocked the world as an example of vindictive and vengeful capital punishment at its worst. The supreme irony was that the actual assassins were already dead, having committed suicide days before. On 10 June 1940, "the hand that held the dagger struck into the back of its neighbor." Italy invaded France and was promptly beaten back. Thanks for the link, and the memorial ... I didn't realize June 10th was the anniversary of Mussolini's big roll of the dice, too. With similar consequences.